This is the poignant moment when a man rescued from the hell he endured at the hands of the Nazis met his saviour almost 70 years later. Joshua Kaufman first saluted his rescuer Daniel Gillespie. Then he kissed his hand and finally, he fell to his feet, exclaiming: ‘I have wanted to do this for 70 years. I love you, I love you so much…’. 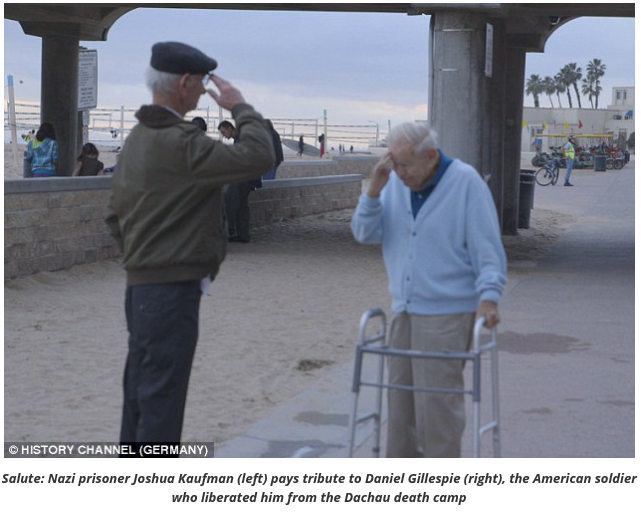 Kaufman, now 87, was a ‘walking corpse’ on April 29 1945 when U.S. Army soldier Gillespie, 89, marched in with his comrades to liberate the charnel house that was the Dachau concentration camp near Munich. Gillespie, a machine gunner with the 42nd ‘Rainbow Division,’ moved to block 11 of the infamous complex which was the first camp built by the Nazis to house its enemies in 1933. By the time it was liberated more than 35,000 people had been murdered there – in executions, in cruel medical experiments, starved, worked and beaten to death. The first person he saw was Hungarian Jew Kaufman. He was hiding in the latrines with other prisoners, uncertain if the soldiers who arrived were liberators or a Nazi death squad sent to liquidate the camp. ‘We were confined to barracks by the guards. This meant most of us were marked for death,’ Mr. Kaufman said. ‘Then I saw the white flag flying from the watchtower and I realized then that the torture was at an end. Gillespie helped the emaciated prisoner into the daylight and back into the land of the living. Both parted with tears in their eyes – both believed they would never see one another again. Kaufman, who lost most of his family in the Holocaust, made it to Israel where he became a soldier who fought in the Six Day War and the Yom Kippur War. He later emigrated to America where he married, fathered three daughters and became a self employed plumber. Gillespie married, fathered eight children and built a career for himself as a successful salesman. 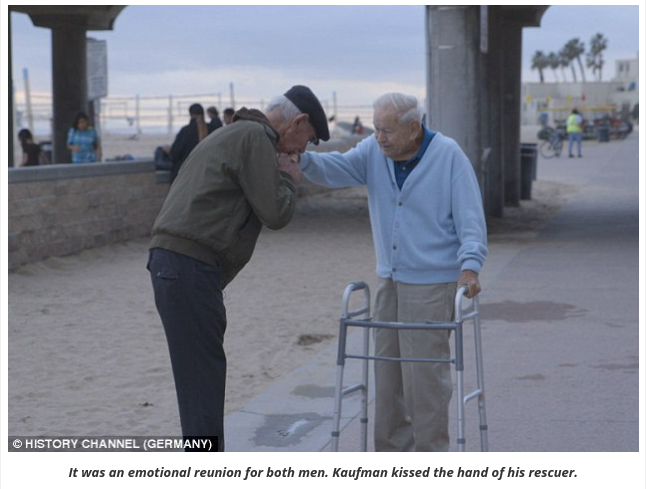 Amazingly, neither knew that they lived within an hour’s drive of each other until a German documentary crew arranged their moving reunion on the sand at Hungtington Beach, California. Gillespie had fought with his comrades through Europe to reach the gates of the Dachau camp. ‘We could not understand it. I grew up in California where we had everything in abundance. ‘We didn’t get how people could let other people starve. They murdered them or just let them die. An emotional and overwhelmed Kaufman replied: ‘Dying would have been easier. In Dachau we had to tote around 50 kilo cement sacks. The whole day long. He described how, to this day, he still sleeps on a thin mattress close to a window so he can gaze out at green grass every day. The meeting, and their stories, will be told in a special for the History Channel Deutschland to be screened on May 31. Both men are old, both realize they will probably never see one another again. But both said they were humbled by their meeting so many years after Nazism was crushed. 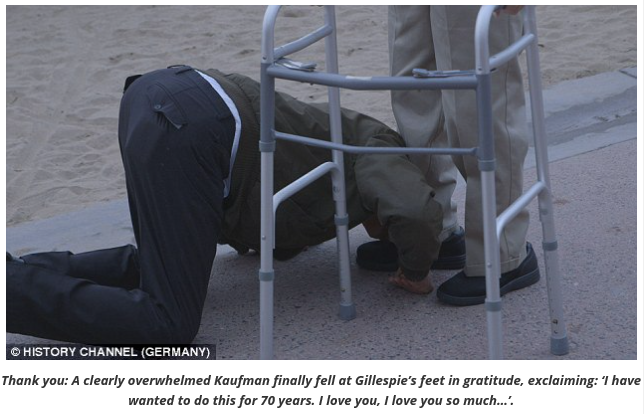 What a profoundly touching story…The last picture nearly ripped my heart from my chest. I’ve visited Dachau twice (once was plenty!) and cannot thank you enough for sharing this!!!!! What a very touching reunion. I hope those that deny the Holocaust ever happened read this. My wife’s uncle was one of the first soldiers over the gates at Belsen and never quite recovered from what he saw there. Our darkest moments, followed by the light… We must ensure that it never happens again. I am so touched. How often each must have thought of the other over the years. If you read my previous blog, this one will bring tears to your eyes. The possibilities in humanity are great. That we waste it most of the time is very discouraging. To excel and rise above the animal that we are we must ignore or break the rules our bodies are born with and do what is not normal. We must care for one another, feed the hungry, clothe the poor, demand of the rich that they do so too. That we do not makes us all complicit in the things we like to think are inhumane but, as it turns out, are all too human. So well spoken. We stand together on this. Wow…… I am humbled by this humanity. What a wonderful story, Theresa. Deeply touching. I didn’t see the irony until you pointed it out. My thanks, Dale, for your much appreciated perspective. Wow, amazing story. War is such a horrible experience, but the death camps were beyond comprehension. If we did, perhaps there’d be a way to prevent them. I wish I had a magic wand. These are the true heroes of our world. Thank you for helping their story live on, to be remembered. As growing up in Germany, I remember a field trip to Dachau, nearby where I grew up, as a child than I didn’t know much about the history, but still I do remember the chills and fear it gave to see the gas chambers. It is beyond my mind to imagine all that fear of death and survival, though I have been in Israel a few times. This man is a hero, if that even is the right word for it. Thank you for sharing. How wonderful that they got to meet after so long a time. I got to hear Corrie Ten Boom speak about decades later meeting the guard from the camp where her sister died and she survived. She described her first reaction and then finding the grace to forgive him. That is how we change the world.